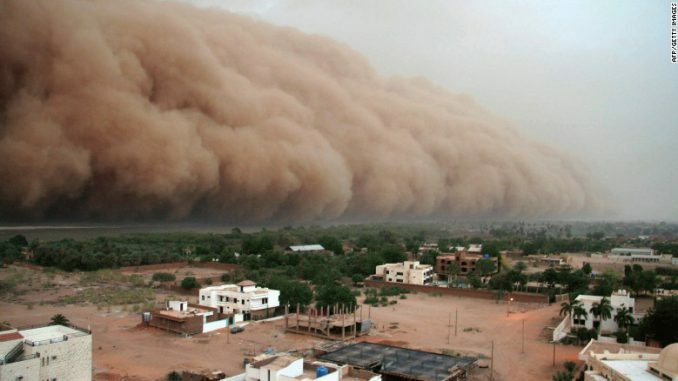 A gigantic cloud of dust known as “Haboob” advances over Sudan’s capital, Khartoum. A Haboob usually occurs after a few days of rising temperatures and falling pressures and can change the landscape in the few hours it lasts by depositing enormous quantities of sand — destroying villages and crops. 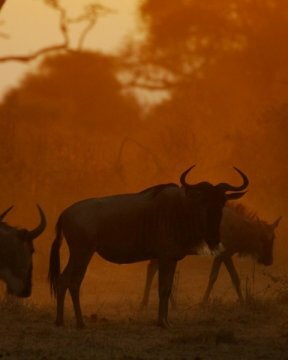 Sudan’s ecosystems and natural resources are deteriorating. Temperatures are rising, water supplies are scarce, soil fertility is low and severe droughts are common. After years of desertification, its rich biodiversity is under threat and drought has hindered the fight against hunger. This burden is affecting not only the country’s food security and sustainable development, but also the homes of many Sudanese families. Dust storms — known locally as “Haboob” have also increased in this region. Moving like a gigantic thick wall, it carries sand and dust — burying homes, increasing evaporation to a region that’s already struggling to preserve water supplies, as well as eroding valuable fertile soil. 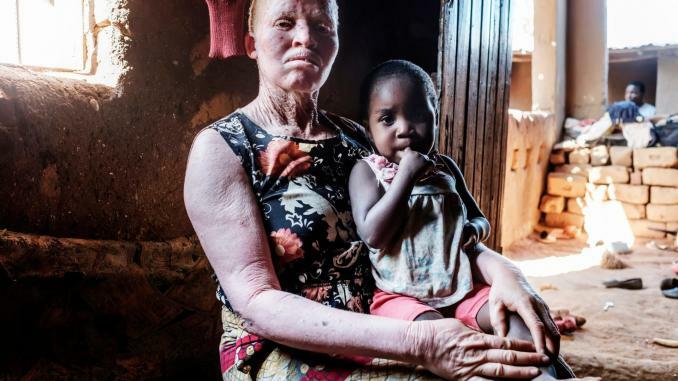 Experts say that without quick intervention, parts of the African country — already one of the most vulnerable in the world — could become uninhabitable as a result of climate change. 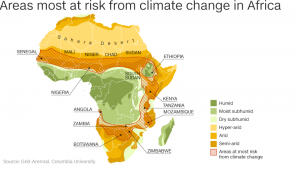 “North Africa is already hot and is strongly increasing in temperature. At some point in this century, part of the region will become uninhabitable,” Jos Lelieveld, a climate scientist from the Max Planck Institute for Chemistry, told CNN. “That will string from Morocco all the way through to Saudi Arabia,” he said. Sudan’s temperature is expected to increase significantly. By 2060, it’s projected to rise between 1.1 °C and 3.1 °C. As a result of hotter climate and erratic rainfall, much of Sudan has become progressively unsuitable for agriculture and villages. Irregular rain has ruined crops and the country is experiencing both droughts and floods — making arable land unsuitable for cultivation and displacing more than 600,000 people due to flood-related disasters since 2013, according to the Internal Displacement Monitoring Center (IDMC). It is estimated 1.9 million people will be affected by reduced agricultural and livestock production — due to smaller farming areas, poor pastures and limited water availability. Michelle Yonetani, a senior advisor on disasters from IDMC, says 70 percent of the rural population are reliant on traditional rain-fed agriculture — for both food and livelihood — while 80 percent of the population rely on rainfall for their water supply. Yonetani said Sudan was one of the most vulnerable countries to climate change because of the issue of food security — it ranks 98th out of 113 countries on the Global Hunger Index, placing it in the top 15 most food-insecure countries in the world. Until the late 20th century, the Sahel — the transitional zone between the desert and the tropical south — was peppered with baobab and acacia trees as well as sparse grass cover. But now desertification is changing the landscape and invading on precious agricultural and habitable land. 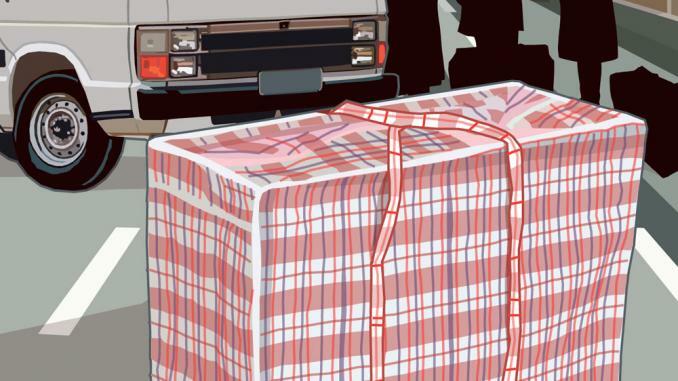 “Communities who are already very vulnerable — who are already suffering from impoverishment, who may be in areas that may be affected by climate change — are pushed to the limits of their coping mechanisms,” Yonetani said. 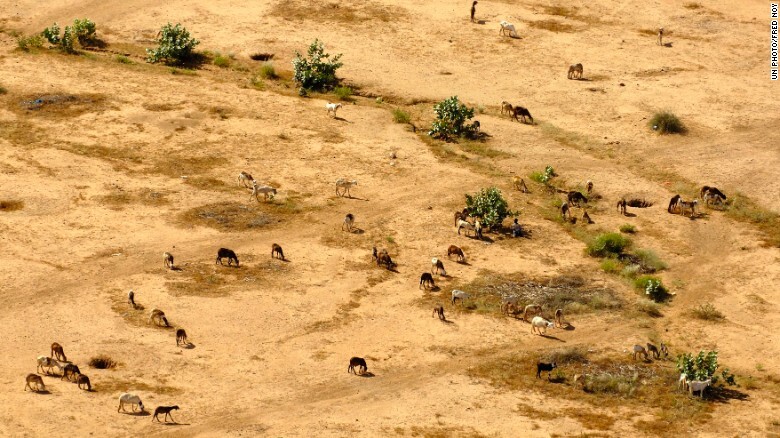 Desertification is encroaching on valuable agricultural land — affecting the livelihoods of many Sudanese farmers. The livelihoods for farmers located in thousands of villages spread across this region are becoming increasingly strained due to heat stress and persistent drought. 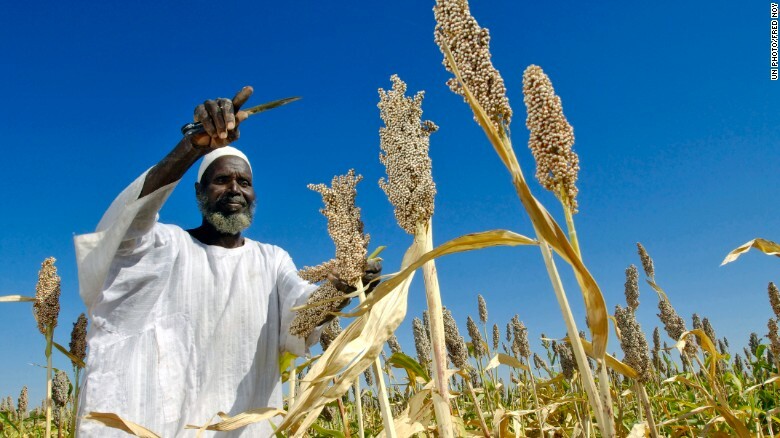 According to a report by the United Nations Office for the Coordination of Humanitarian Affairs (OCHA), it is estimated 1.9 million people will be affected by reduced agricultural and livestock production — due to smaller farming areas, poor pastures and limited water availability. 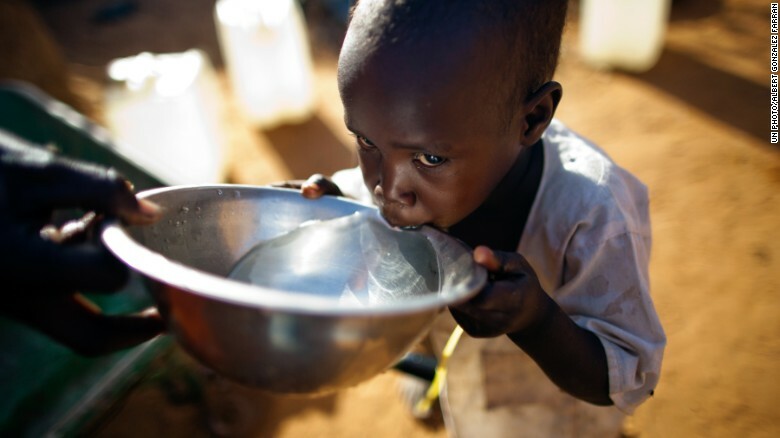 According to the United Nations Office for the Coordination of Humanitarian Affairs (OCHA), 3.2 million people are expected to face water shortage. Sometimes locals are forced to walk for miles to find a water point. But Head of Programme for the World Food Programme (WFP) in Sudan, Marco Cavalcante, told CNN it’s not too late to change the country’s future. 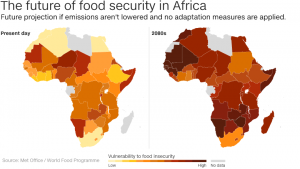 In order to make a lasting impact against climate change, holistic adaptation and mitigation efforts need to target farmers, pastoralist communities as well as vulnerable groups who are affected by the food insecurity. The government released a renewable adaptation plan in July which published agreed strategies to protect Sudanese people — particularly those in rural communities. “It’s a very positive sign that there is a political commitment,” Cavalcante said. 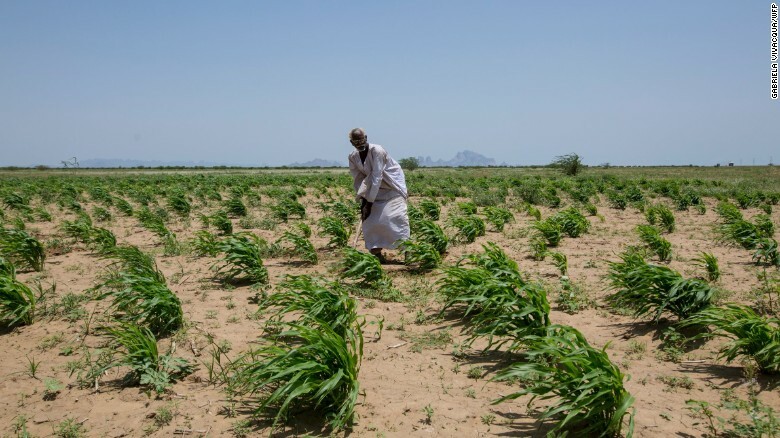 Shifting climatic conditions has a dramatic effect on Sudan’s livelihood and food security. Within the report, Sudan’s Ministry of Environment has broken down adaptation plans for each region of Sudan. Strategies include drought resistant crop varieties that can withstand shifting climate conditions, more efficient irrigation technologies and improved crop storage. WFP’s Cavalcante added that crop storage was important to ensure farmers weren’t forced to sell right after harvesting when the price may be low. Construction the haffirs (water reservoirs) can supply communities with hygienic water for both humans and livestock. The report also outlined plans to dig more wells and boreholes to alleviate water scarcity. 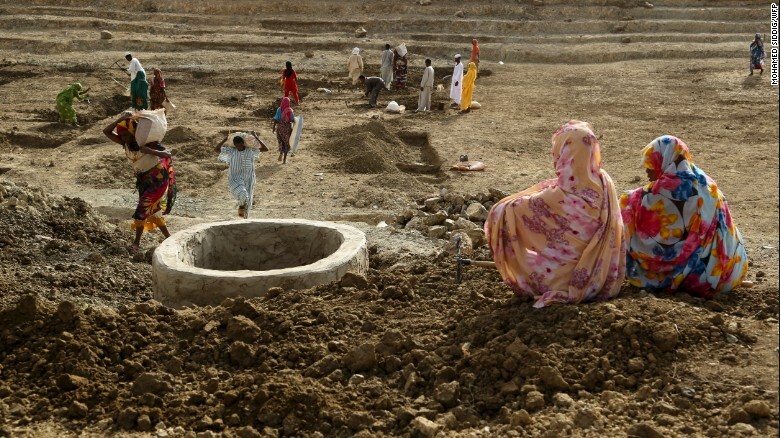 The WFP also has helped Sudan construct “haffirs” (water reservoirs) to help retain water and boost crop yields in years of poor rainfall. Communities are also already being taught how to plant trees to help combat desertification — which Cavalcante says has a “substantial impact” on Sudan’s future. The Great Green Wall was conceived as a 7,700-kilometer tree belt streching the length of the Sahara Desert to stop desertification. 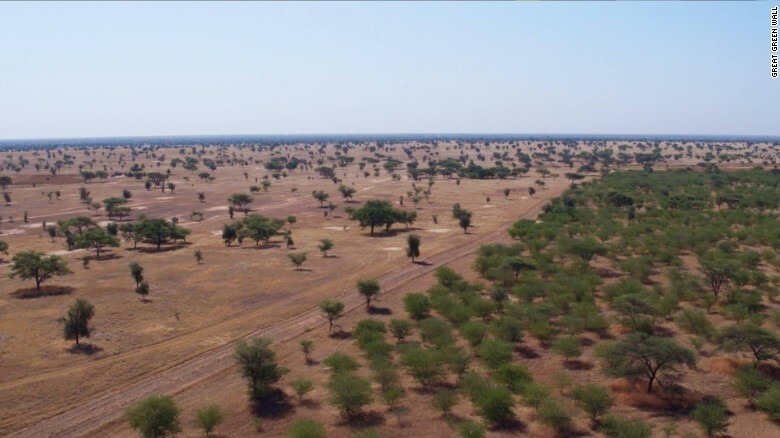 Can the Great Green Wall change direction? Health is also a large focus of the government’s adaptation plan. It says climate change could accelerate the spread of malaria, yellow fever and cholera — and while investment into education to ensure humans are more resilient to climatic shocks is important, there also needs to be research into the link between rising temperatures, water stress and the spread of those diseases. While Sudan is making efforts to fix the issue of climate change — it’s not one that the country can fix alone. Climate change is a global challenge affecting every continent — and the need to reduce greenhouse gas emissions, according to scientist Lelieveld, is one of the most important aspects. 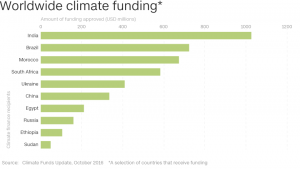 Despite being one of the most affected countries by climate change, the funding Sudan receives to help combat the pressures is significantly lower than other countries. Experts say it’s going to take a substantial amount to expand adaptation projects to lower temperatures, prevent desertification from intruding on precious habitable and agricultural land and to educate communities on how to adjust. “There needs to be far more investment and early measures to strengthen the resilience at the community level,” Yonetani said. “Now really is the time to push governments to act and mitigate,” she added. Unless the world is prepared to take on refugees as a result of the food crisis and uninhabitable areas, “we will have to help Africa to invest and protect itself,” Lelieveld said.